Our calendars for 2013 are now on-line .. The large calendar is also offered in both A4 International and standard N American formats for $5. 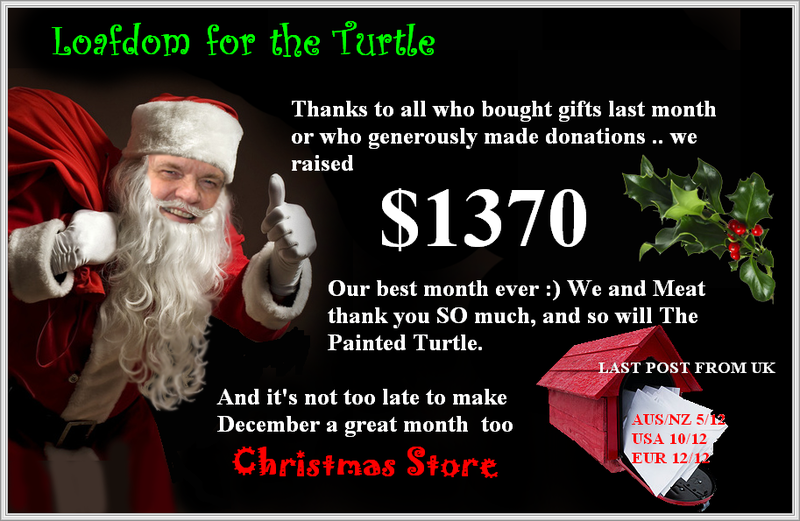 All profits go to The Painted Turtle. It's Pay Day!! Last one for Christmas shopping, and we have great gifts for anyone and everyone at $4-$12, and maximum shipping $3. Every cent we make goes direct to the charity Meat loves and supports, and is a gift to some very special and deserving children. This picture says it all. 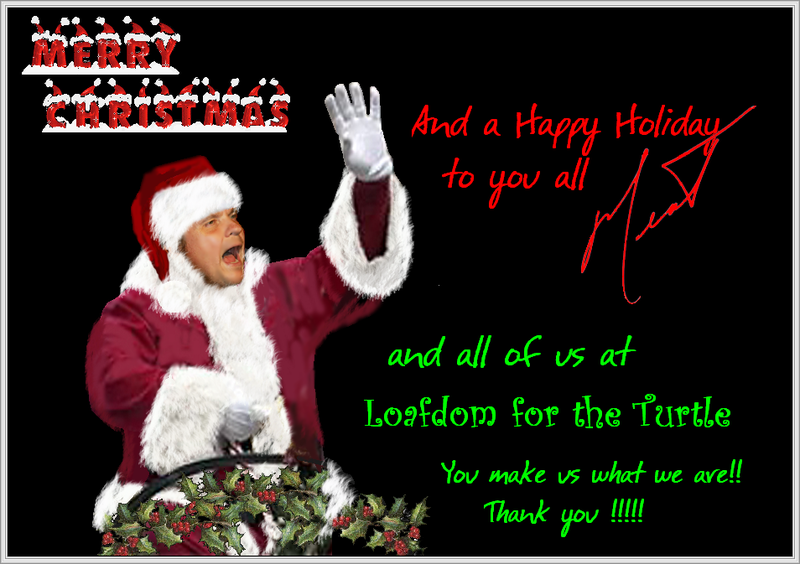 We at Loafdom for the Turtle and Meat wish you all the happiest of Christmases, and thank you so much for all your support this year. Meat's more than a little magic And you have helped keep the magic of The Painted Turtle going for so many wonderful children. You have helped change lives for the better, and that is the greatest gift of all. We can only echo Meat's message and say We love you, we thank you, and keep on rocking!!! 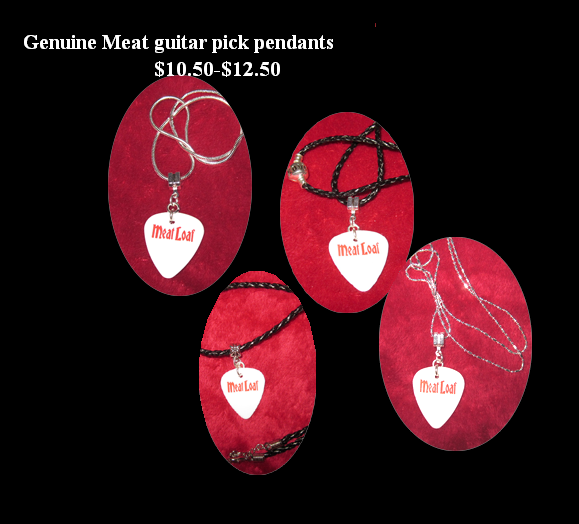 Our Meat Loaf guitar pick pendants (picks Meat donated himself to raise money for TPT) are perfect for those going to a show or a M&G, and come on a variety of chains/neck cords to suit anyone. "I got my lovely Meat guitar pick pendant yesterday. I love it! I didn't realize the chain would actually be sterling silver! It's really classy, but edgy, too!" Thank you .. and they're on their way!! Got my Big Momma at Cardiff. They're pretty cool aren't they? So, if anyone follows The Painted Turtle FB page, I'm sure you are following about the fires that have affected the camp. Please leave room for an extra prayer, looks like they will need extra funds this year to help them recover. 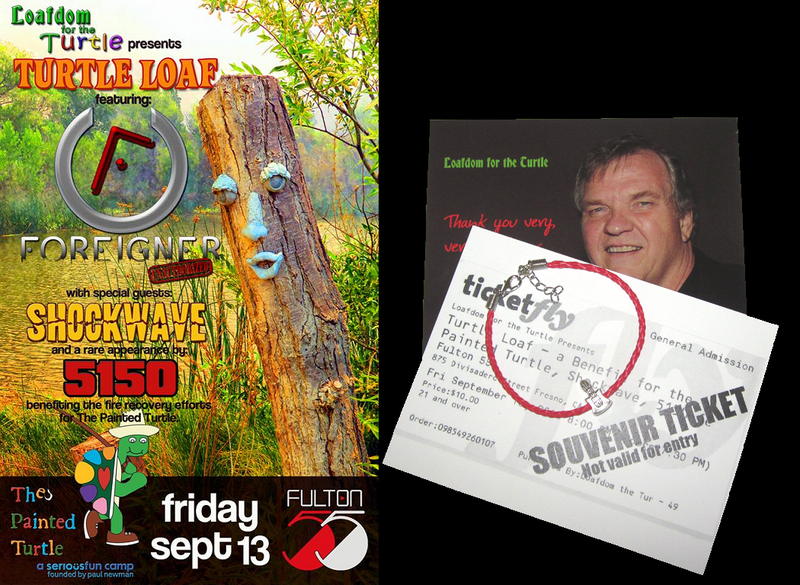 Tickets are now on sale for LFTT's first live fundraiser on Friday 13th September in Fresno, Ca .. a benefit concert of great rock and roll!! All the bands are appearing free, the venue are making no charge, Yevonda will be selling our jewellery, and we hope to sell all 550 tickets for entry to the show. Whatever we raise will be matched by Newman's Own Foundation and the SeriousFun Children's Network, so please pass this on to all your friends and ask them to do the same; somewhere in those ripples there will be folks near Fresno who could get there for the concert. Benefit rock concert in Fresno at Fulton55 on 13th September for The Painted Turtle, helping change the lives of sick kids in California. 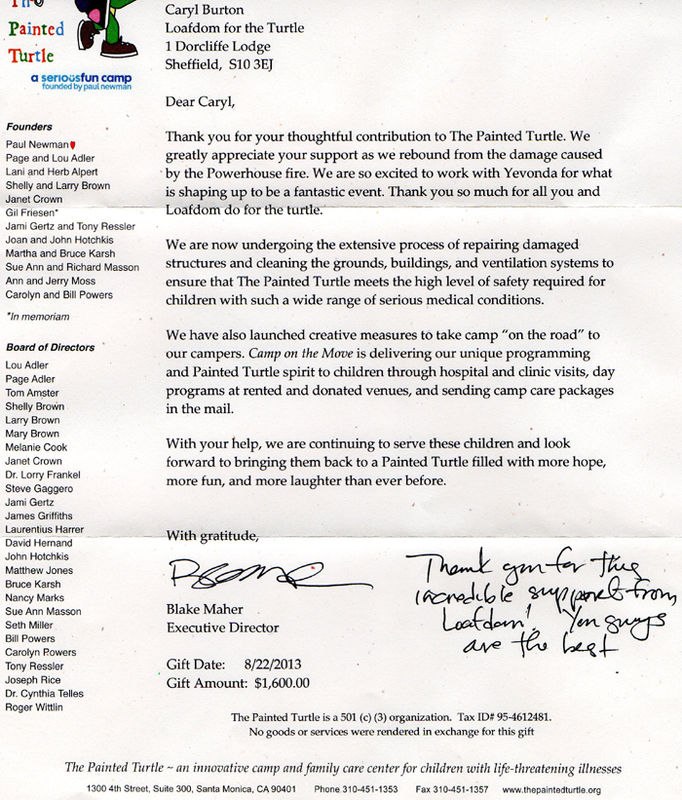 Received today from The Painted Turtle ..
You hit the nail on the head Caryl, if it weren't for the great donors and supporters of LFTT non of this would be possible. You guys are all awesome and greatly appreciated. Thank you for everything you have all done and for helping spread the word about LFTT. Tuesday Morning .. and just two more DAYS to go and it will be Friday 13 September, the date of Loafdom for the Turtle's first benefit concert at Fresno, Ca, organised single handedly by Yevonda Buchele, a Meat fan who is not in the "business", and who has secured a 550 capacity venue for nothing, three great rock bands free of charge, and arranged local media coverage. 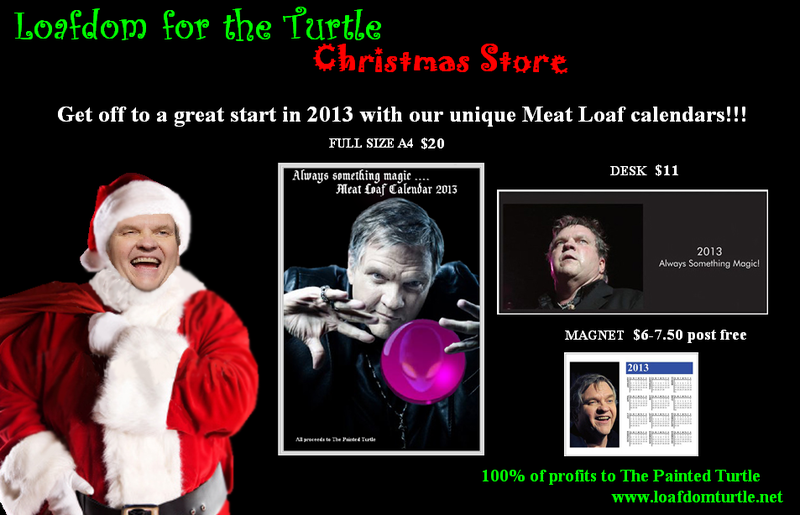 This is as far as we know the first big benefit concert pulled off by any Meat Loaf fan to raise funds for The Painted Turtle. Or be with us in spirit by purchasing a souvenir ticket and leather friendship bracelet for $10 + 50c towards postage. Well .. congratulations Yevonda. I'm proud to know you And I hope you sell out, and we can send TPT a BIG cheque!! Thank you so much for your efforts with this event and I hope it is a roaring success. A "Last at Bat" desk calendar, with previously unpublished photos, and our calendar magnet for 2014 are on sale now; our glossy 2 week to the view, and download calendar will both be on line soon. We get a lot of views on this thread. Please check our site out for your gifts this Christmas. With no overheads and a few dollars over cost added to benefit the charity, our prices are really low yet our quality excellent, and our fixed flat postage rates of 69p in the UK and $3 overseas, however much you buy, are the lowest you'll find. We have gifts from $5 (under £3.50) and a wide range of jewellery including solid silver necklaces, bangles and bracelets, fashionable pearl bracelets (glass and cultured), leather bracelets, and non-jewellery gifts like credit card cases, atomisers and finger puppets for the little ones. Every item you buy as a gift comes with a free gift box and a card so the recipient knows their gift helped a sick child. Low prices, no fares or gas, no crowds the fight your way through, and all delivered to your door in gift packaging at low shipping costs. 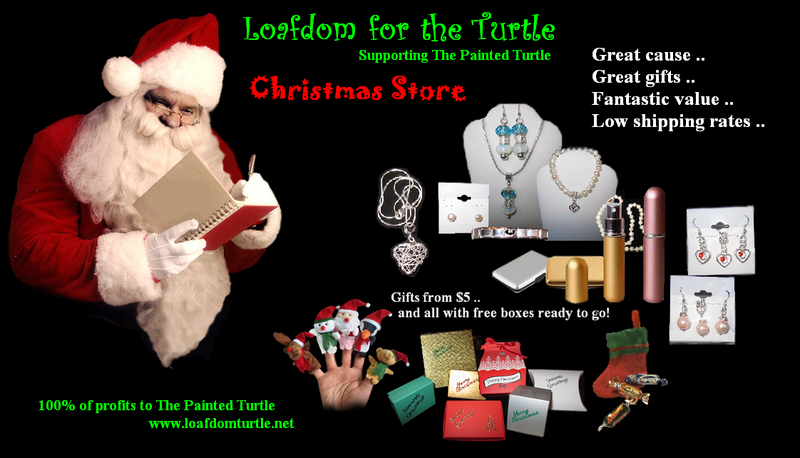 We have launched a new website to raise money for The Painted Turtle .. AAbacus Jewellery, selling good quality 925 silver jewellery at low prices, none of it Meat Loaf themed .. just good classic designs. 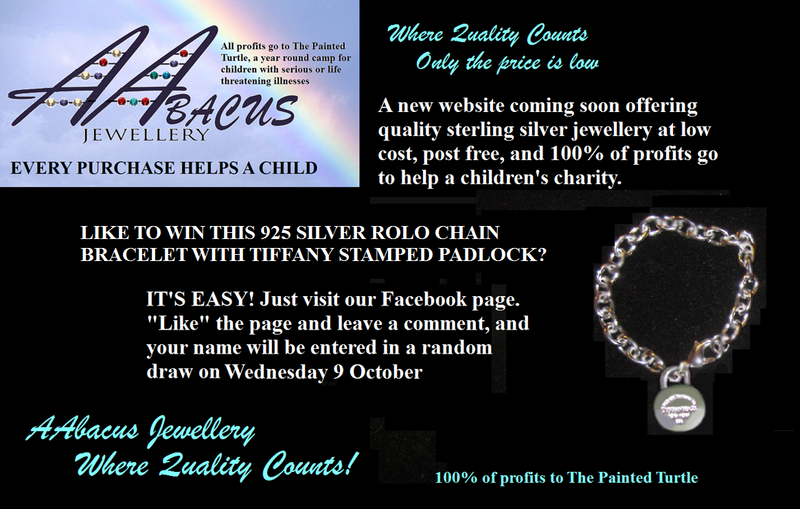 Would you like to win this silver bracelet with functioning Tiffany Replica padlock? You can take the padlock off and wear on a chain .. so it is two pieces of jewellery in one .. and the chain bracelet is adjustable up to 7.5" .. but we can put the lock onto one up to 8.5" if you need. Value at least $23 even at our low prices! To be in the draw, just make sure you have liked our AAbacus FB page, share this picture FROM OUR PAGE where it is pinned at the top, and post a comment. Page generated in 0.15973 seconds with 14 queries.